Satellite cloud tops have warmed. Dry air is getting entrained into the circulation. Hurricane hunter recon reports pressure up at 10 pm. These are all factors telling us that Earl is still weakening. 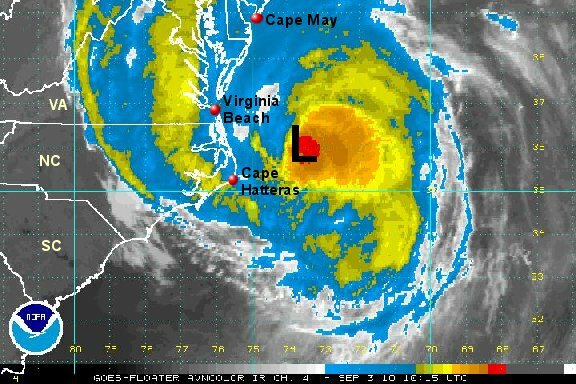 It appears to be heading in a direction that will take the eye of the hurricane at least 75 miles east of Cape Hatteras. Cape Hatteras just reported a wind gust to 49 mph. That's the strongest we've seen so far. Heavy rain covers the Outer Banks and Pamlico sound. As of 10 pm edt / ast hurricane Earl was centered near 33.6° N / 74.5° W or about 100 miles south southeast of Cape Hatteras, North Carolina / 580 miles south southwest of Nantucket, Massachusettes. Top sustained winds are estimated at 100 mph (110 mph nhc at 8 pm advisory). Movement is north northeast at 18 mph. Pressure 951 mb. On the Outer Banks winds will be at their strongest into Friday morning. Tropical storm force winds are will occur inland 50-100 miles with gusts to hurricane force winds likely on the Outer Banks and possibly farther north. Pay close attention to the positioning of the hurricane warnings and local emergency advisories! Earl will be moving roughly 75 miles east of Cape Hatteras over the next several hours. After this models take it about 100-150 miles east of Long Island by Friday evening...... to 50-100 miles east of Cape Cod midnight Friday night. Earl is expected to make landfall in southern Nova Scotia, Canada Saturday morning. A small shift of 25--50 miles can make a huge difference in the impacts received on the coast. Earl is now moving away from land. North Carolina has seen heavy rain in the far eastern part of the state with doppler rain totals of 2.5 - 6" of rainfall. Wind gusts at Cape Hatteras were recently observed at 62 mph. We did not see any hurricane force reports, although some gusts to minimal hurricane force or roughtly 75 mph was very possible. The closest pass to Cape Hatteras was about 80-85 miles to the east. Now that the hurricane is pulling offshore, it is doubtful that winds will be very strong on the Mid-Atlantic coasts. Virginia Beach still may have a gust to minimal tropical storm force early this morning though. The next location to see tropical storm force winds will probably be eastern Long Island this evening and certainly eastern Massachusettes. We are doubtful that Cape Cod will see hurricane force winds, although gusts to hurricane force are not going to ruled out quite yet. Better safe than sorry! Stay prepared in eastern Massachusettes! With recently satellite imagery we are going to lower the wind estimate of Earl. Even 95 mph may too strong. There has not been a recent recon and NHC is likely waiting to get the official report to take winds down farther too. 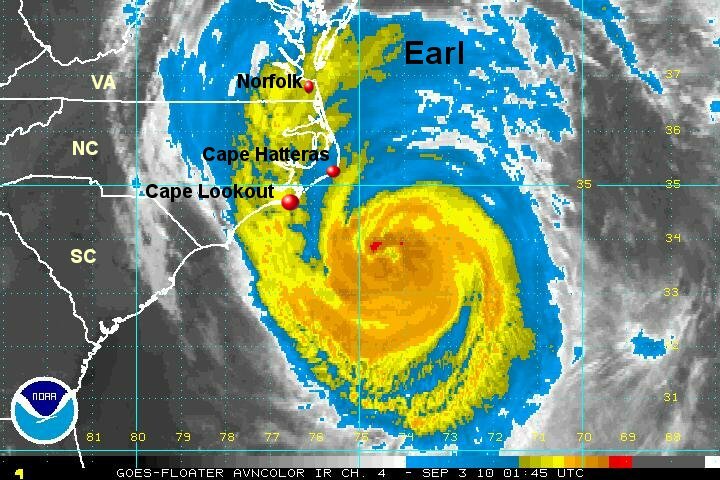 As of 7 am edt / ast hurricane Earl was centered near 36.0° N / 73.5° W or about 125 miles east northeast of Cape Hatteras, North Carolina / 155 miles east southeast of Virginia Beach, VA / 400 miles south southwest of Nantucket, Massachusettes. Top sustained winds are estimated at 95 mph (105 mph nhc at 5 am advisory). Movement is north northeast at 20 mph. Pressure 955 mb. Earl will be moving about 100-150 miles east of Long Island by this evening...... to 50-100 miles east of Cape Cod midnight tonight. Earl is expected to make landfall in southern Nova Scotia, Canada Saturday morning. A small shift of 25--50 miles can make a huge difference in the impacts received on the coast. 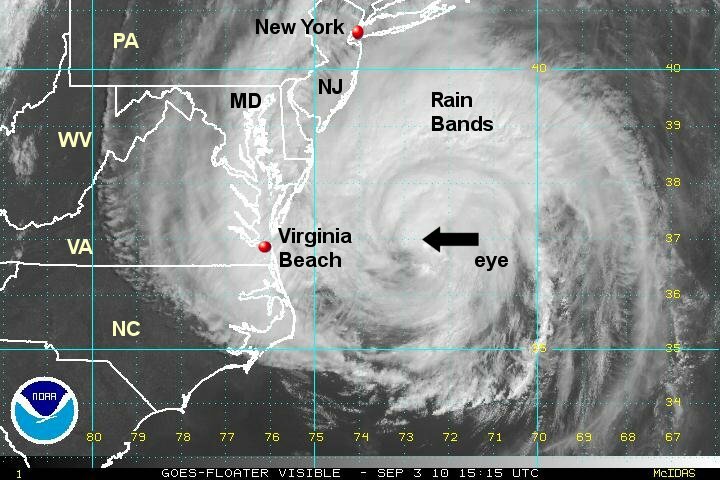 In our estimation Earl is barely a hurricane with the eye structure in bad shape. Surface reports from a recent recon suggest that it isn't even that strong. As expected the hurricane center dropped their winds way down. Eastern Massachusettes and probably eastern Long Island will have tropical storm force winds later this evening. A gust to hurricane force is possible in extreme eastern Massachusettes, but is becoming less likely as Earl weakens. It looks like the hord of reporters looking for a story will only have rain and some gusty winds. As of 12 pm edt / ast hurricane Earl was centered near 37.0° N / 72.8° W or 325 miles south southwest of Nantucket, Massachusettes. Top sustained winds are estimated at 75 mph (85 mph nhc at 11 am advisory). Movement is north northeast at 21 mph. Pressure 961 mb. A variety of watches and warnings are posted from North Carolina north to Nova Scotia. Check the official national hurricane center link below for that information. 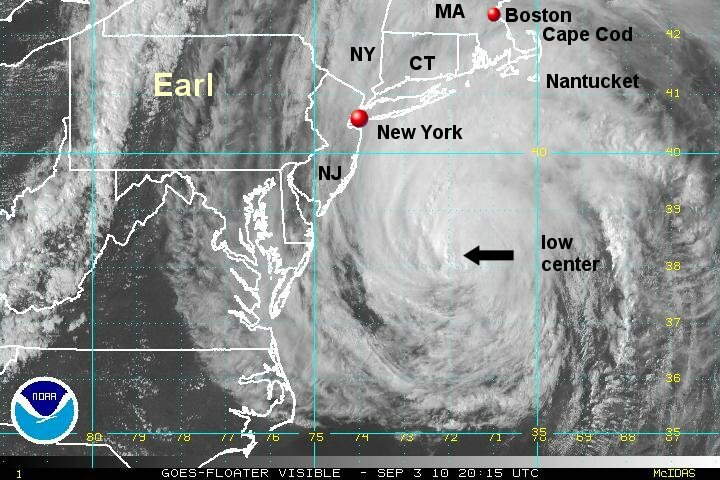 As of 5 pm edt / ast hurricane Earl was centered near 38.2° N / 71.8° W or 175 miles east of Ocean City, Maryland / 190 miles south of Montauk, NY / 230 miles south southwest of Nantucket, Massachusettes. Top sustained winds are estimated at 75 mph (80 mph nhc at 5 pm advisory). Movement is north northeast at 22 mph. Pressure 961 mb. Watches and warnings are posted from New York to eastern Canada. Check the official national hurricane center link below for that information. Earl will be moving about 150-200 miles east of Long Island by this evening...... to 75-125 miles east of Cape Cod midnight tonight. Earl is expected to make landfall in southern Nova Scotia, Canada Saturday morning. We are on the same page as the hurricane center on this advisory. Recon hurricane hunter data suggest that the winds are going down below hurricane strength. So, as per our previous advisory we think that Earl is just below hurricane strength. The latest check of winds show gusts to minimal tropical storm strength in eastern Massachusettes and only 15 mph at Montauk. It looks like a lot of reporters are scrambling again....reporting on rain and winds that are 15-40 mph. The pressure is going down, but the system will be over colder soon. As of 11 pm edt / ast hurricane Earl was centered near 40.0° N / 69.7° W or 140 miles southeast of Montauk, NY / 90 miles south southeast of Nantucket, Massachusettes. Top sustained winds are estimated at 70 mph (70 mph nhc at 11 pm advisory). Movement is northeast at 25 mph. Pressure 958 mb. Earl is expected to make landfall in southern Nova Scotia, Canada Saturday morning. 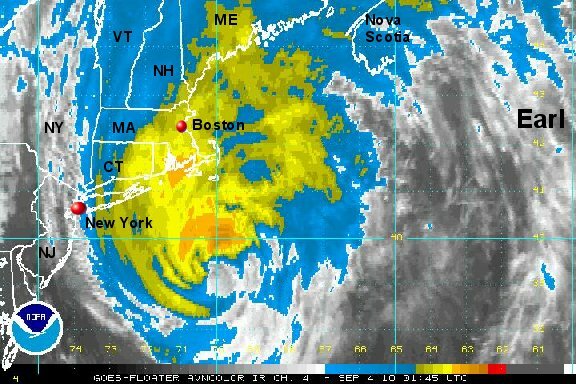 Earl is just about to make landfall on the southern coast of Nova Scotia. It still has an impressive view on satellite imagery with a large eye structure. It actually looks more impressive than last evening. If it wasn't for the colder water that Earl is over we would almost think that Earl is a minimal hurricane again. It will be interesting to see what the recon finds just before landfall. As for now we agree with the hurricane center with keeping Earl at 70 mph. All watches have been discontinued for the U.S.
As of 8 am edt / ast tropical storm Earl was centered near 42.9° N / 65.8° W or 30 miles south of Cape Sable, Nova Scotia. Top sustained winds are estimated at 70 mph (70 mph nhc at 8 am advisory). Movement is northeast at 30 mph. Pressure 965 mb. 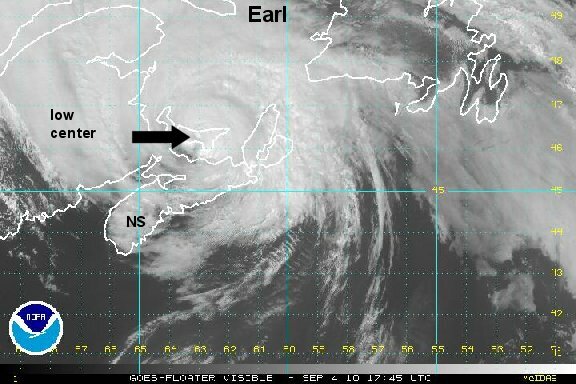 Earl made landfall just east of cape Sable in southern Nova Scotia earlier this morning. It moved along the coast then made its way inland. It is now over the northern part of the Gulf of St. Lawrence. It will again make landfall in eastern Canada as it becomes extra tropical. Earl will continue north across northern New Brunswick and back into the far north Atlanntic toward Iceland. 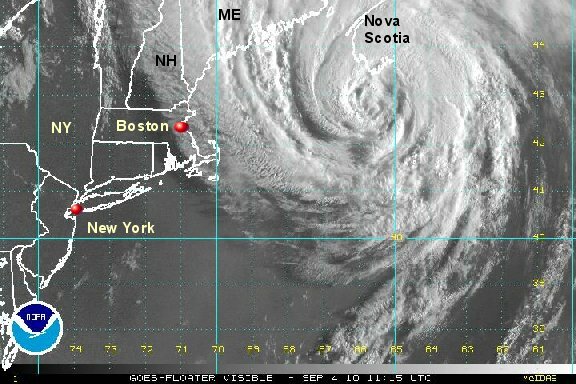 The satellite picture is from earlier this afternoon as it was about to move over the Gulf of St. Lawrence. This is our last update on Earl.